Jack Black Protein Booster Skin Renewal Serum, 2 oz. As seen in Men's Health magazine (June 2010 issue, p167). 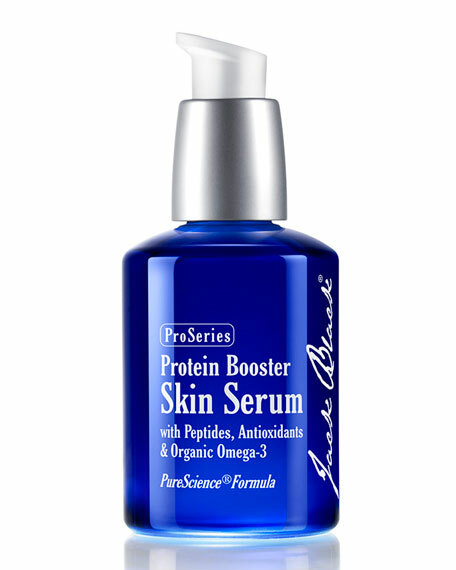 Protein Booster Skin Serum with peptides, antioxidants & organic omega 3 PureScience® formula. Matrixyl® 3000 shows up to 45% less wrinkles in 2 months. SYN® -AKE smoothes expression lines yielding up to a 52% reduction in wrinkle size. Patented anti-aging ingredient, Renovage® increases moisturization up to 68% and lessens pigmented spots by up to 56%. Naturally derived Dynalift, works to immediately tighten and smooth skin. Natural antioxidants, Plantago and Organic Green Tea, counter free-radicals. Organic Botanical Omega 3 provides essential fatty acids and proteins to moisturize skin. Plant-based amino acid maintains osmo-regulation and helps recovery from shaving nicks. To use: Apply directly to clean skin on face and neck, or combine with daily moisturizer,sunscreen or after-shave gel for even greater benefit.